I don’t know about you, but I love road trips. To me, road trips are one of the best ways to travel. Period. I love watching that asphalt disappear beneath my car, and seeing the landscape change throughout the day. I love the cheesy little roadside attractions and the greasy spoon diner gold you always inevitably discover along the way. I love staying in a new place each night, and connecting with new people each day. Road trips are a ton of fun, and can be cheaper than other types of travel if you approach it with some smarts. I’ve always tried to camp along the way on road trips, because it’s always seemed cheaper to me. Lately, however, it seems like camping is getting costlier and costlier. In the past few years, I feel like I’ve paid the same per night for a campsite as I would a motel room. Curious if it’s true, I thought I would investigate whether or not campsites are any cheaper than hotels or motels. What I’ve discovered is that there is no one answer to this question. Like your brother’s relationship status on Facebook, it’s complicated. If you camp at a provincial park in Canada or a state park in the USA, you’re going to spend more. If you’re in a popular camping destination, expect to pay even more. For instance, at Cultus Lake, near Chilliwack, BC, the rate for a campsite per night this year is $120, while a night at the nearby Travelodge is around $70-$80/night. Of course, the Travelodge is on the highway instead of a pristine lake, which is a pretty big downside. If you choose to camp along the backroads, making use of Forest Services campgrounds or campgrounds on reservations, you’ll spend less. Some of these sites are even free. There are cost-free campgrounds run by Forest Services, and if you stay in a campsite on a reservation, sometimes there’s no one to come and collect your fees. The downside to these types of sites, is that they lack the same conveniences as provincial or state parks: there are no maintained bathrooms or showers, no electricity hookups and in most cases, there are no sources of clean drinking water at all, so you have to make sure you pack enough of your own. Choosing a motel allows you to drive longer during the day. You don’t need time to set up camp, get a fire going and cook your own dinner. You won’t need time to break camp down in the morning either. Choosing a motel can come with a free continental breakfast, which will save you even more money. Choosing to camp will require you to lug around piles of bulky camping equipment, leaving very little space in your car. The final verdict is that you can camp cheaper, if you’re willing to give up some conveniences and take the time to travel the backroads. If this is what you choose to do, don’t leave home without a backroads mapbook. If you’re traveling in Canada, you can grab them here: backroadmapbooks.com. There are also loads of apps for your smartphone with backroads maps. These maps will help you locate the cheaper places to camp. You should also consider mixing it up a little. In places where camping can be expensive, opt for the motel instead that night. You don’t have to camp every night, and if you choose to do some camping on the backroads, you’re going to need to find a way to shower, anyway. So, grab a motel room from time to time and switch it up. As always, the key to saving money on your accommodation during a road trip appears to be thorough planning and research. 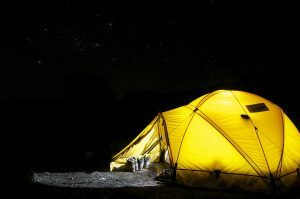 Sort out where it’s cheap to camp and where it’s not cheap to camp beforehand and plan your nights around that. Be sure to take into consideration the time it takes to set up and tear down camp when planning your daily route, as well. If you plan carefully, you’ll keep your road trip expenses to a minimum, and you’ll be able to come home with more cash in your pocket. So, what are you waiting for? Hit the road!